This one strikes panic in many a homeowners heart. It not only means the toilet can’t be used—a huge inconvenience for 1-bathroom homes—but that your bathroom and other areas of your home can experience significant water damage. You can stop the overflow by turning the valve on the feedline to stop the flow. If you have an older toilet that does not have this valve, you can open the tank and rig up the chain to the flapper to stop the water flow. If this is the case, our next recommendation is going to be upgrading your toilet. Have you ever considered a water saving, low-flow, toilet? So let’s talk about preventing this problem to begin with. It’s important to note that anything outside of toilet tissue should never be flushed. This includes makeup remover wipes and other wipes that are marketed as “flushable.” While they may seemingly go down easy, they can get caught up in the pipes, and build up until they create a clog that prevents water from escaping the next time you flush. A minor sink clog that is near the surface may be easily cleared out with a plunger and a little bit of “elbow grease,” and perhaps even a hand-cranked drain snake if you have one. If these basic tools don’t resolve the problem though, please don’t reach for the chemical drain cleaner you got at the store. These liquid drain cleaners may relieve a clog, temporarily, but they are corrosive and caustic, not only causing problems for your plumbing system down the line, but also exposing you and your family to the toxic fumes that emit from them. We urge you to give us a call so we can use more tried and true methods, such as hydro jetting, to not only relieve the clog but reduce the risk of it occurring again. Another way you can prevent clogs from occurring is by watching what you allow to go down the drain. In the bathroom, this can mean using a drain cover in your shower so that your hair doesn’t go down and clog it up. In the kitchen, it means avoiding putting FOG down the sink drain. FOG stands for fats, oils, and grease—which all congeal as they cool, building up until you have a major blockage on your hands. 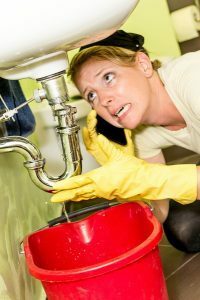 The two above mentioned problems are what we typically get called for most often, but blocked sewer lines, pipe leaks, and lack of hot water also have our phones ringing pretty regularly, too. The best thing you can do to prevent plumbing problems is to schedule plumbing maintenance. This allows our pros to fully inspect your system and attack minor issues that can turn into much bigger problems later on. Call BZ Dependable Plumbing & Heating Inc. today for exceptional customer service and guaranteed satisfaction!